Fall camping means delicious pumpkin treats and we have fun ideas for you to try this year. You’re going to be able to make these, before you even arrive at the campsite, and bring them with you. This will save you time while camping and leave you lots more time to play. These Autumn delights will take about 10 minutes to put together. For the cookies you’ll need white sugar, brown sugar, butter, vanilla, canned pumpkin, eggs, flour, baking soda, cinnamon, and salt. The frosting requires powdered sugar, vanilla, some butter, and a little bit of milk. 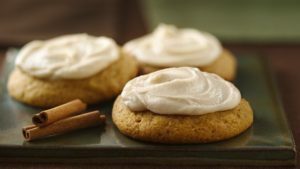 One of the tricks for the wonderful flavor of these cookies is that you will be lightly browning some butter before making frosting with it. It the depth of flavor that you will all in love with. These are so much fun and the kids will be coming back for seconds. You’ll start with a packaged sugar cookie mix and add a little bit of flour, some canned pumpkin, butter, cinnamon, and egg. For the frosting, you will add marshmallow cream, butter, and powdered sugar. Once the cookies are baked and cooled you’ll spread this sweet cream filling between two of the cookies and just like magic you have Pumpkin Whoopie Pies. You can make these ahead and pop them in the freezer. Then drop them in your cooler and they can slowly thaw or you can pull them out to thaw when you’re ready for them. This delicious bread makes a perfect addition to your camping breakfast. It goes great with that first cup of coffee in the morning or it is a just right snack in the middle of the afternoon. You’ll need flour, baking soda, salt, cinnamon, nutmeg, sugar, butter, eggs, water, canned pumpkin, chocolate chips, and chopped pecans. This is another recipe that is well-suited as a make-ahead dessert. You can find the full recipes and directions for making these treats at 13 No-Fail Pumpkin Desserts. We hope you enjoy your Fall camping and have made your reservations. If not, be sure to check out our member campgrounds for the perfect place to go camping and RVing in Virginia.